Grab the attention of your customers and visitors by advertising your product or service. 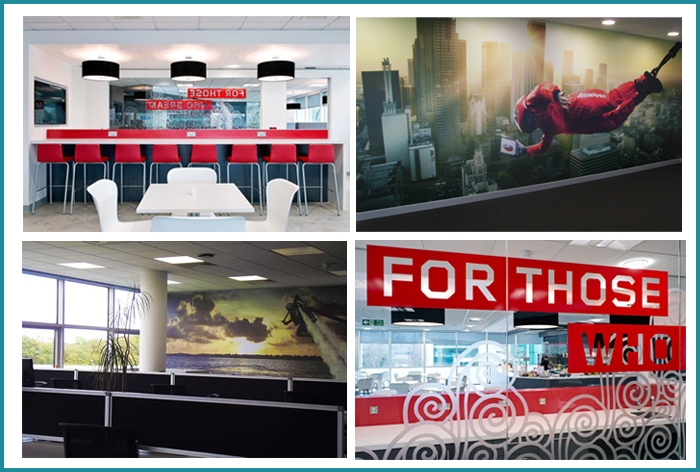 Transform your business space with digitally printed wall murals to create an eye catching focal point or transform your windows into dynamic messaging boards to promote your products & services and attract more foot fall. A well designed wall mural, feature wall decals or wall art can completely transform an otherwise plain, unused wall or blank space in your shop, restaurant, hotel, office place, medical or dental practice into a colourful and vibrant work of art. Our fantastic wall art designs instantly make your space more inviting for customers, enticing them to stay longer and call back more often. Full colour digitally printed wall murals work in pretty much every environment, be it home, office, retail or commercial spaces. 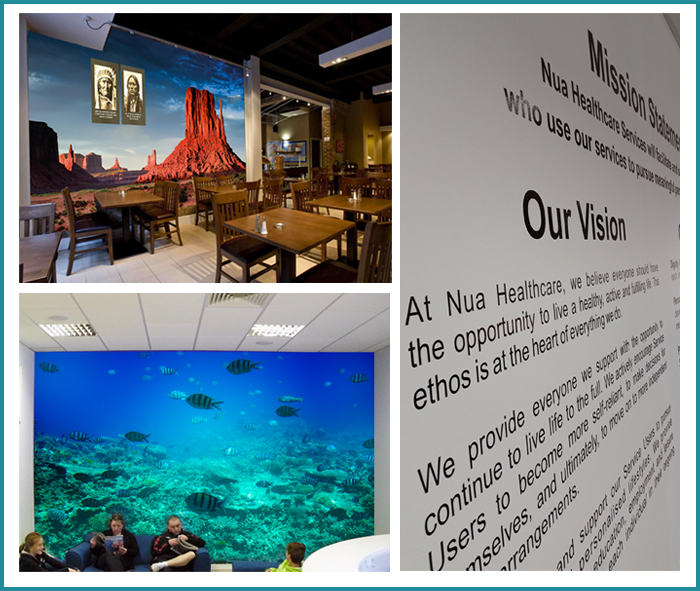 Sign Solutions….every sign imaginable, recently installed full colour digitally printed wall murals for our clients, Lenovo’s, a global Fortune 500 high tech edge company, at their new facilities in Swords, Co. Dublin. We used a clear UV matt finish laminate overlay to protect the images from direct sunlight. The new addition transformed their office area into a professional space. 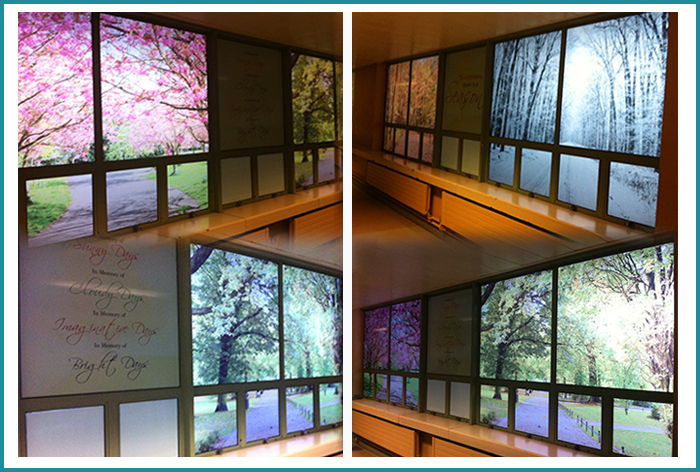 The lovely ladies at Naas General Hospital, Bernie McMahon and Sister Mary Lalor asked us to create a design for the internal & external windows along the hospital corridors. Sister Mary and Bernie wanted something specially created that would incorporate the four seasons that would bounce colour along the corridors but would also allow natural light from the outside to come through. We designed, printed and installed the full colour digital images to the windows on a clear media material, allowing daylight from the outside to shine through. Frosted etched glass was installed to the external windows which allowed for the internal images to be seen from outside. The images measured a whopping 12m wide! 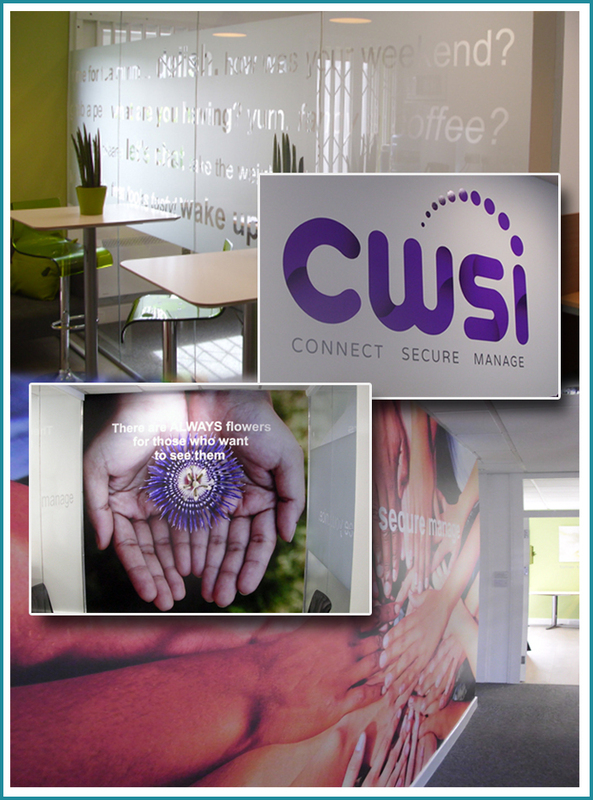 CWSI, Sandyford, a dedicated Mobile IT Integrator based in the UK and Ireland asked us to incorporate their logo branding in their digitally printed wall murals and window graphics. The installation of these images panels and window graphics transformed their office hub. If you are interested in window or wall graphics, please contact our Team at Sign Solutions. Previous From Storeroom to Playroom…Family Room in the Children’s Leukaemia Ward receives a makeover!